Brewing beer and making wine at home is not only good fun and incredible value compared to the price of buying commercially produced beer and wine, but is extremely easy and involves little more than allowing yeast to turn a sugary liquid into alcohol. There are many ways to do this and Colchester Homebrew Supplies, one of the largest specialist homebrew retailers in East Anglia and the Home Counties, can make the process even easier. 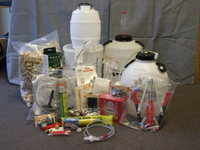 Colchester Homebrew Supplies stocks all sizes of brewing bins and wine fermenters, beer barrels, beer and wine bottles, plastic and glass demijohns, cleaning and sterilising solutions, syphons, testing equipment, beer and wine heaters, numerous strains of beer and wine yeasts, gas injection systems, water treatments, clearing and fining agents suitable for both beer and wine, corks, crown caps and all the usual (and some fairly unusual) specialist brewing equipment needed to help you succeed in this most fascinating of hobbies. 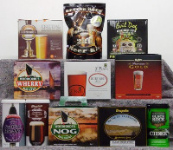 If you don't want to have your homebrewing entail anything more complicated than adding sugar and water to the contents of a can of ready prepared ingredients, we usually have over 110 types of single and twin can beer kits in stock. Almost all styles of beers are available as home brew beer kits, including Real Ale, Bitter, Brown Ale, Cider, IPA, Irish Stout, Lager, Pilsner, Scottish Heavy and Yorkshire Bitter, in kits that produce up to 40 pints and which are generally ready for drinking in less than three weeks, but will improve if left to mature for a couple of extra weeks. Home winemakers are equally well served as our range of around 50 styles of wine kits allow you to choose from all the main varietal grape styles such as Chardonnay, Cabernet Sauvignon, Hock, Merlot, Mosel, Pinot Grigio, Pinot Noir, Rioja, Sauvignon Blanc, Shiraz, Valpolicella, VCDR (Chateauneuf) and White Zinfandel, which are available in both 6 bottle and 30 bottle sizes and can be fermented out in 7-21 days. 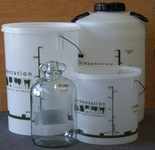 For experienced and enthusiastic all grain brewers needing grains, malt extract or hops to brew their own beer recipes from first principles, or for country winemakers requiring grape juices, wine flavourings or any of the specialist additives that help turn the most unlikely base ingredients into surprisingly drinkable wines, we can supply everything you need to enjoy quality homemade beers and wines at a fraction of the cost of commercially produced brands. Our homebrewing and winemaking starter kits and mini breweries are superb as Christmas, Birthday, Mothers Day,Fathers Day, Valentines Day or Retirement presents and all the equipment can be reused again and again. All items displayed on this site are held in stock and ready for immediate despatch or can be reserved for collection from our shop on Severalls Industrial Estate in Colchester, England's oldest recorded town. If any item is unavailable, or you can't find a product that you are looking for, please contact us and we will do our utmost to obtain it for you.